La Belle Assemblée Strikes Again! 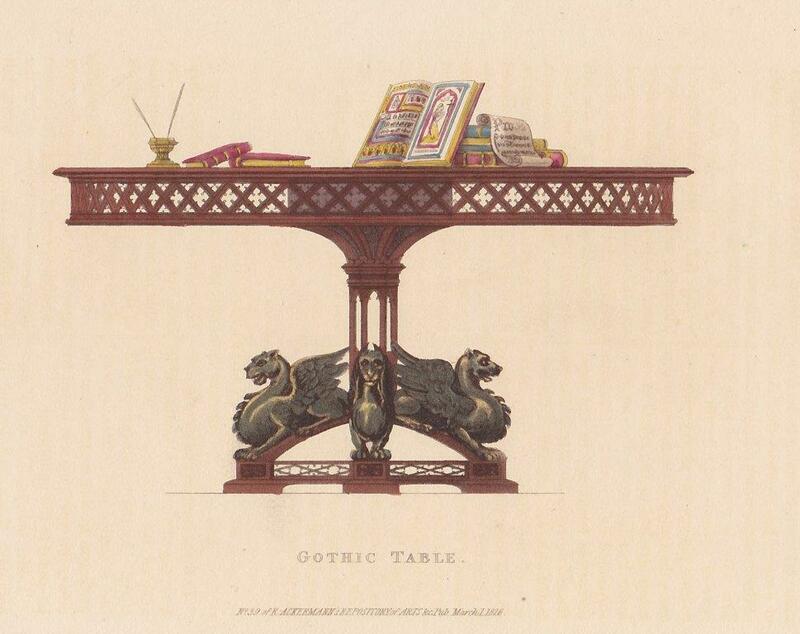 Literature wasn’t the only thing that was influenced by the Gothic craze in 18th and early 19th century England. 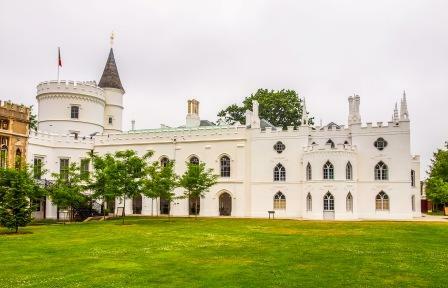 Horace Walpole, who’d started the whole Gothic thing with The Castle of Otranto, built and decorated his home, Strawberry Hill in Twickenham as a sort of fairytale homage to the middle ages... and for the next hundred and fifty years or so, this fanciful style fell in and out of fashion. Well, if it was good enough for Prinny, it was good enough for the rest of society...and our old friend Mr. Ackermann followed suit in The Repository with a series of illustrations of Gothic furniture, suitable for fashionable homes everywhere...even if your house wasn’t Strawberry Hill. 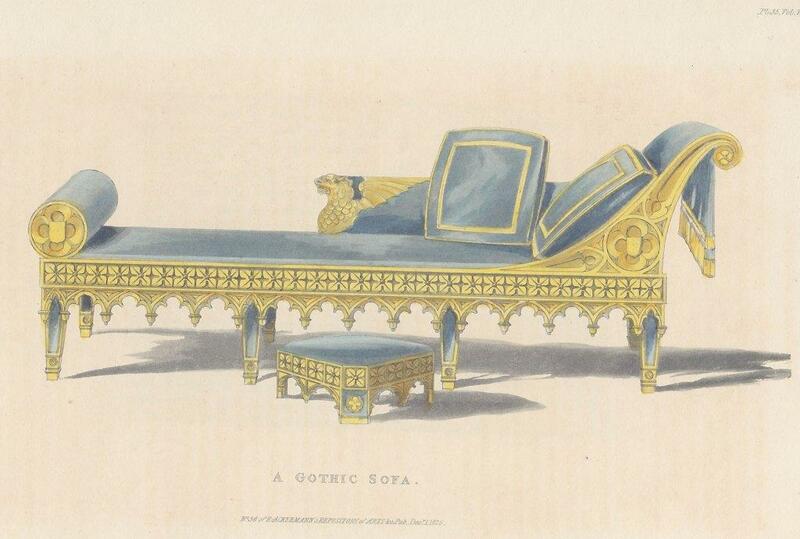 The series started in 1825, but the interest in Gothic decor was already well underway, as demonstrated by this State Bed from the September 1823 issue. 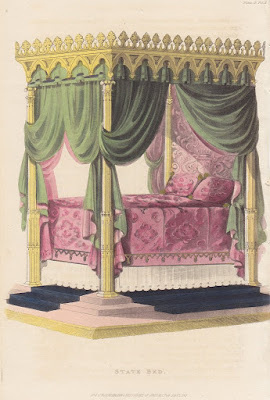 The description is interesting: The authors who have written on the arrangement of furniture in olden times, have given to the common bed a width of six feet, and to state ones an altitude quite unknown to the present day, except as we see it exemplified in some of our very ancient mansions, whose chambers exhibit the four-post bedstead at from 20 to 30 feet in height.... The recurrence to such sources for designs of furniture for buildings in the Gothic style is to be desired, because they afford the means of assimilating them to such edifices, in accordance with the practices of the times which they are intended to imitate. Here we have an Episcopal Chair in The Repository's November 1825 issue (...the wood is of light oak with gilt mouldings, relieved by rich crimson velvet cushions and tassels. 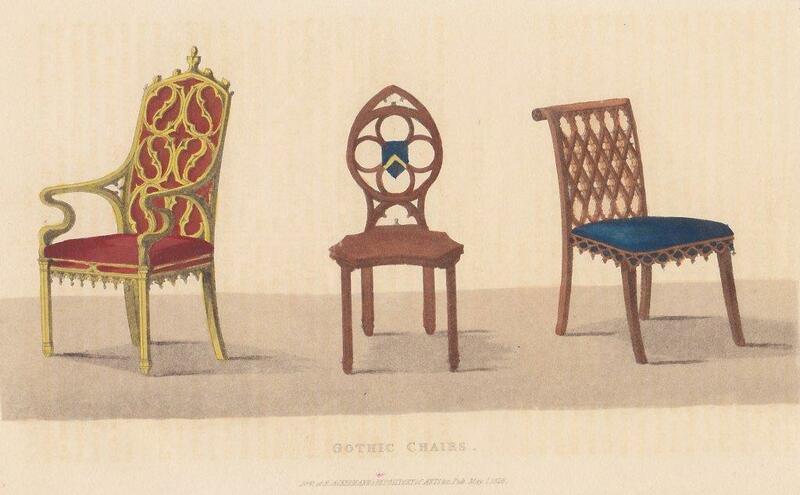 This chair may be introduced with propriety into a church, prelate's mansion, or an extensive library.) The Drawing-Room Chair...is light oak, and the mouldings gilt; the tracery should be filled up with velvet of the same colour as the room; perhaps it would be more appropriate if it were of rose-wood or cedar. And the Table for a Boudoir (can I pretty please have a boudoir some day?) is also of oak or rose-wood. I do like the griffin-like beasts guarding the pedestal of this Gothic Table from March 1826, as well as the illuminated manuscripts and books so artfully displayed on its surface...because of course, doesn’t everyone just have to have a table like this to display their 14th century psalter collection? Somehow this plate really brings home that these plates are truly advertisements—that they are selling a "look" to which readers longing to be fashionable should aspire. And to end on a high note (see what I did there? 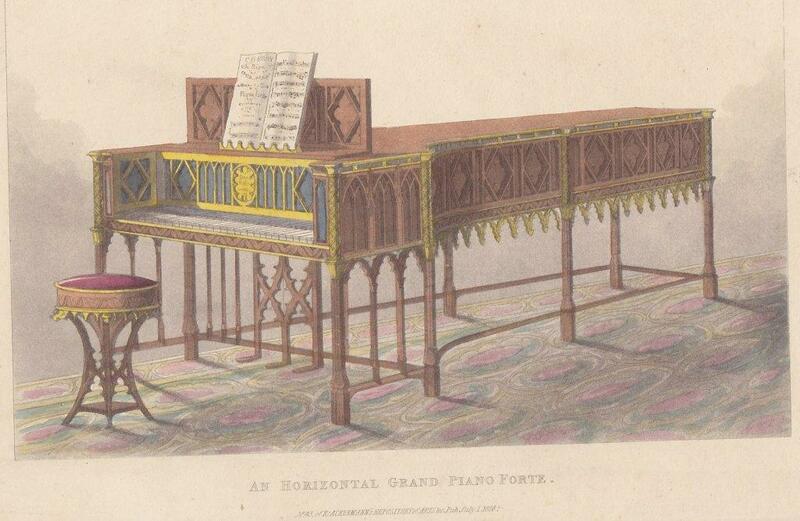 ☺) we have An Horizontal Grand Pianoforte (July 1826’s Repository). 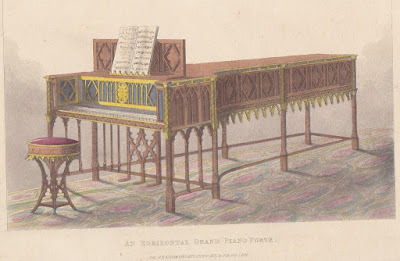 Even the editor who wrote the descriptive copy accompanying the plate is forced to recognize the irony of decorating a pianoforte, a relatively recent invention at the time, in the style of many centuries past: This instrument being totally unknown to our ancestors, and only invented within the last half century, we can merely decorate the given forms by traceries and other Gothic ornaments best calculated to assist the sound, and to fulfil the intent of the instrument. 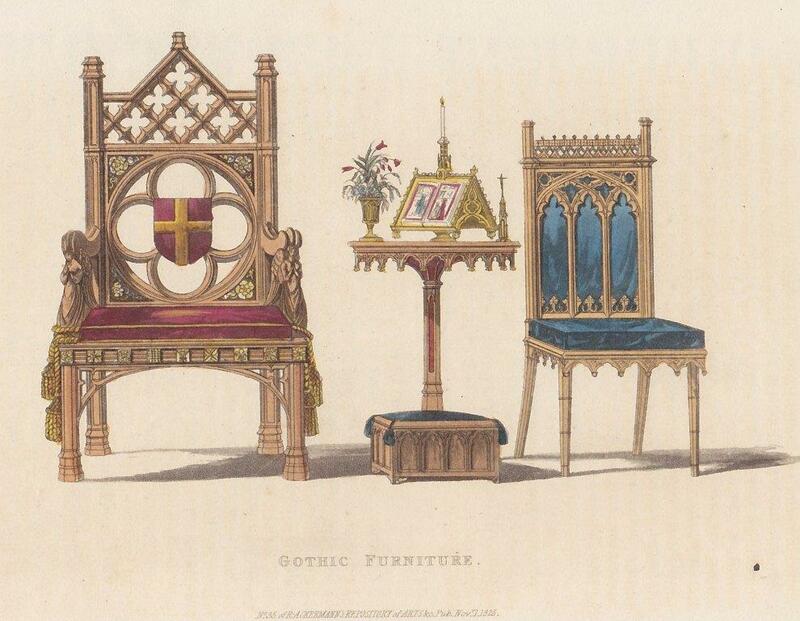 I’ll post more Gothic furniture in coming weeks...which was your favorite? I have a lengthy bucket list of places I want to see, many of them in England. I have a much smaller bucket list of things I long to own, including a period-correct (a good reproduction would do) quizzing glass, a stereograph of the Grand Canyon taken before 1900, and a piece of Wedgwood. I have looked for the first and last many times but was always turned away by either the price or the poor quality. Imagine my surprise, then, to discover at the back of an antique mall in the cozy little town of Kalama, the stuff that dreams are made of. 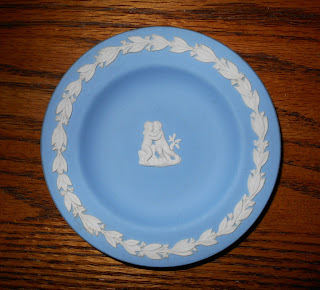 I have blogged about my obsession with Wedgwood before. I had no illusions that I could afford a piece dating from the nineteenth century. But it wasn’t so much the age of the piece but the classical rendering that was important to me. It had to be the famed Wedgewood blue, with white embossing, the color and shape so reminiscent of the Regency period I love. You can see I got my wish—blue and white, classical pattern--cherubs embracing. I have researched the maker’s marks on the back and can safely say while mine is genuine Wedgwood, it isn’t an antique. It proudly sports a registered trademark symbol, which wasn’t used until 1974. It’s October (also known as Pumpkin Spice Month 😛) and we are fast approaching Halloween and the spooky season, when people seem to enjoy a good scare. But as we’ve discussed before, liking a good scare isn’t solely a modern phenomenon: the nineteenth century equivalent of the slasher film was the Gothic novel. We’ve had some discussion of Gothic literature here on NineteenTeen in past years, but did you know that there was a whole publishing company devoted to publishing books that go bump in the night? William Lane, born some time around 1745, began his career as a printer in London then opened a circulating library in 1774, becoming sufficiently successful to commence publishing books in the 1780s. 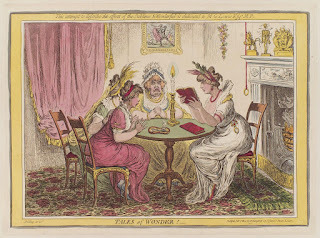 He obviously kept a weather eye on what was selling well, and in the 1780s, what was selling well were books like The Castle of Otranto and The Old English Baron—works that allowed readers to be surprised, spooked, and titillated without ever leaving their comfortable chairs by the fireside. 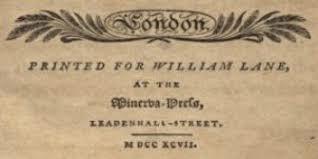 So William began to include similar titles in his publishing list, which he now named the Minerva Press, moving his operations and circulating library around the corner to Leadenhall Street...and business took off. Calling his imprint the Minerva Press was a stroke of marketing genius: the name Minerva (the Roman goddess of wisdom) lent a certain respectability and a highbrow, classical veneer to the endeavor, though his books were firmly in the popular literature camp. And while his list included non-Gothic romance, earlier 18th century fiction, and even some non-fiction, the Gothic novel is what Lane’s Minerva is remembered for. Of course, he had his detractors. The quality of his books was derided; evidently, production values were not high...but that enabled him to sell his books much more cheaply (and in larger quantities.) And also of note was the fact that many of his most popular authors were women—Regina Maria Roche, Eleanor Sleath (whose books were among those recommended by Isabella Thorpe to Catherine Moreland in Northanger Abbey)*, and Eliza Parsons were among his top names. Though they did not make much money from selling books to Minerva Press because the profit margin was a slim one, multiple women authors got their toes in the publishing door through Minerva. So...are you wondering just how spooky some Minerva Press’s novels were? You need wonder no longer: Valancourt Press has reprinted dozens of Lane’s titles as well as a good helping of other Gothic fiction. You too can settle in a comfortable chair by a good fire, and be terrified most deliciously. *Amusingly, it was thought that Jane Austen had made up many of the titles of Gothic novels mentioned in Northanger Abbey, until some scholarly detective work in the 1920s revealed that they had all, indeed, been realio, trulio published works. I’ve written several posts about jobs in the nineteenth century, often starting with information from A Book of English Trades, the guidebook used to inform young adults about what job they might want to pursue. I was looking for something interesting to blog about this time and stumbled across the entry for plumbers. And what I found surprised me. I should start out by saying that our family has lamented for some years that no relative grew up to be a plumber. Fixing piping continues to be a prized skill around here. It apparently was an important skill in the early nineteenth century too. In London, plumbers were one of the Livery Companies. The Worshipful Company of Plumbers was chartered in 1611, but their crest dates to decades earlier. Members agreed to certain ordinances to ensure work was done to standards. What do all these things have in common, you might ask? 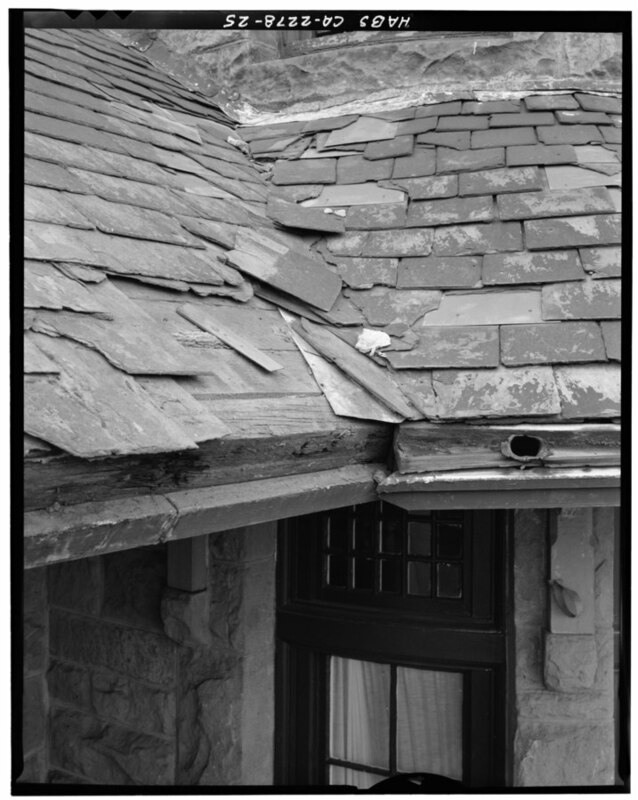 They were all made with lead in the nineteenth century. Lead was the primary metal of choice for plumbers. Seems those thirty shillings a week ascribed to the trade came at a cost. I still want a plumber in the family. 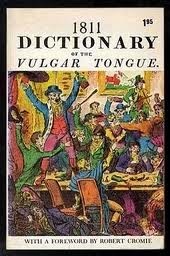 Oh, the Rabelaisian buffet that is the 1811 Dictionary of the Vulgar Tongue! What’s your favorite word or phrase this time? I’m personally torn between Friday face and cow-handed, though betwattled is just lovely. Some of you know that I was once and occasionally still am a writer of technical documents. That’s why I was particularly thrilled when I discovered this nineteenth century heroine. 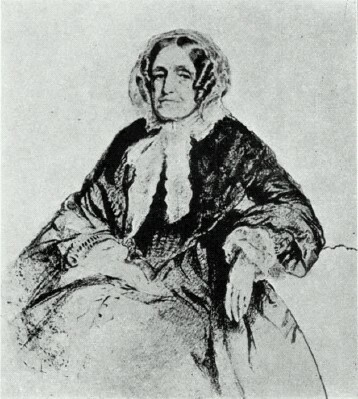 Jane Marcet may be one of the first technical writers, a person with some education and access to scientists who could translate their lofty ideas into something for everyone to marvel at. Her work is credited with influencing countless young ladies as well as the famous chemist, Michael Faraday, who read one of her books when he was a teen and decided to go into science. Jane certainly didn’t start life in a way that would suggest she would follow that path. She was born in 1769, one of a dozen children of a wealthy Swiss banker and his wife. She was educated at home along with her brothers. Her mother died when she was only 15, and she became the manager of the household and her father’s hostess at the parties he liked to throw. On a trip to Italy when she was 27, she decided she liked painting and was tutored by no less than Joshua Reynolds and Thomas Lawrence, two of the foremost portrait painters of the day (my Lady Emily is insanely jealous of the fact). But Jane didn’t become a painter. She was 30 when she married a Swiss physician living in London. Her husband was one of the Grand Amateurs I’ve written about before—a man of letters who dabbled in chemistry. 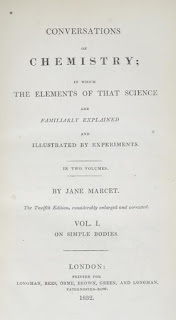 He and Jane conducted experiments together at home. When their four children were old enough, Jane involved them as well. 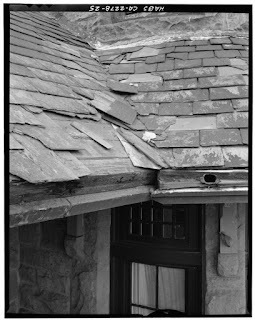 She also took care of her father, who lived with her until he died in 1817, leaving her an inheritance. Based on that income, her husband quit his medical practice and became a full-time researcher. Meanwhile, Jane had decided that she would write a book. Her idea turned into a series of books. 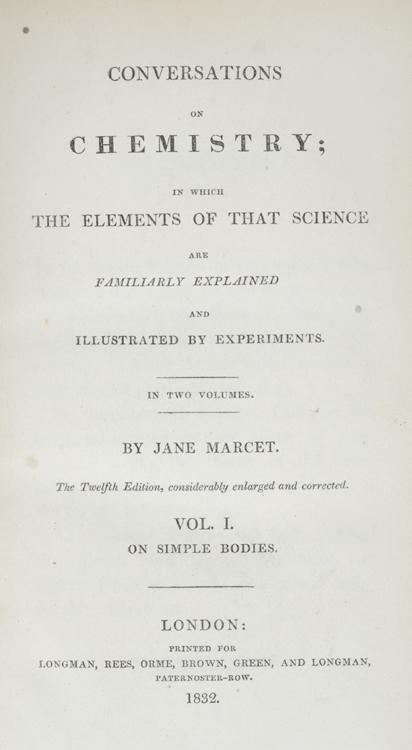 The first to be published was Conversations on Chemistry in 1805. She wrote it as a fictional dialogue between a teacher and two students. What was remarkable at the time was that both the teacher and the students were female. Not so remarkable? Though she wrote and illustrated it, it was published anonymously. She would not be credited with the work until 1832. The work was widely plagiarized in America, where it was claimed by a number of different male authors. The work was an instant sensation. Like any good piece of technical writing, it made science accessible to those who were unfamiliar with it, perhaps experiencing it for the first time. Governesses used it, girls’ schools used it. Even boys’ schools used it. She went on to write Conversations on Natural Philosophy, Conversations on Plant Physiology, and Conversations on Political Economy. She continued to issue new editions, the last of which was published with she was 84. Her books were translated into German, Dutch, Spanish, and French. Jane died in London when she was 89, but her works continued to be used as textbooks, for boys and girls, until after the turn of the century. These early La Belle Assemblée plates never cease to delight me! 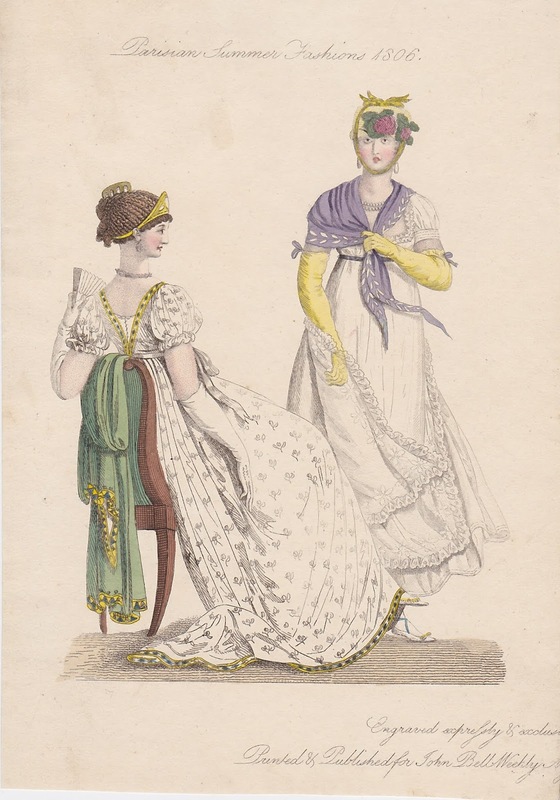 This September 1806 print seems fairly quiet on first glance; two muslin dresses, appropriate for summer...though it never fails to amuse me that even while the country was engaged in the bitterest of battles with Napoleon, English fashion magazines of the times serenely continued to report on the latest Paris fashions... But to borrow a phrase, the delight in this print is in the details. A round train dress of Moravian worked muslin, with correspondent border, worn over white satin; white satin sash, tied in front; long waist, with robbing back; round bosom, cut low, embroidered border round; no neckerchief; a short full sleeve, gathered into a puckered roll the size of the arm; the hair parted near the forehead, the front in close curls, divided from that which forms the crown by a tiara of frost-work studded with antique medallions in the centre, the rest of the hair formed into various horizontal braids, twisted into a knot on the crown of the head, and fastened with a gold comb, the ends formed into curls; necklace and ear-rings of amethysts, linked with wrought gold; India muslin scarf, richly embroidered with an embroidery of purple and gold; white satin shoes; and white kid gloves. Now, the details...first, notice the lacing fastening up the back of the dress at left? Most fascinating of all is her hair; most probably a classical borrowing, perhaps from Greco-Roman statuary, but striking nonetheless. Definitely not to be attempted at home without help! Plain muslin dress, a walking length, a ribband laid flat round the bottom; a patent net apron, with an embroidered border in stars, and a lace put full all round; the bosom of the dress cut rather low, and a full plaiting of net all round; a short sleeve rather full, confined with a plaited band of muslin the size of the arm; a small straw hat, a little turned up on one side, no rim on the other, but the vacancy occupied by field-flowers, or roses; a band of yellow sarsnet is passed under the chin, and tied in a bow on the top of the crown; no hair is seen but on the sides; a half square of lilac muslin, embroidered with a border of laurel leaves in white, is thrown negligently round the neck, and confined simply with the right hand; necklace and ear-rings of pearl; gloves of yellow kid, tied above the elbow with a bow of lilac ribband; sandals of the same, laced with lilac; lilac ribband round the waist, and tied with a small bow and long ends behind. 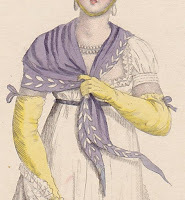 I’m a little amused by the direction that the shawl of lilac muslin is to be “negligently” draped and “confined simply with the right hand”; what if the poor girl is right-handed and needs to use her hanky while out walking in the garden of an evening? 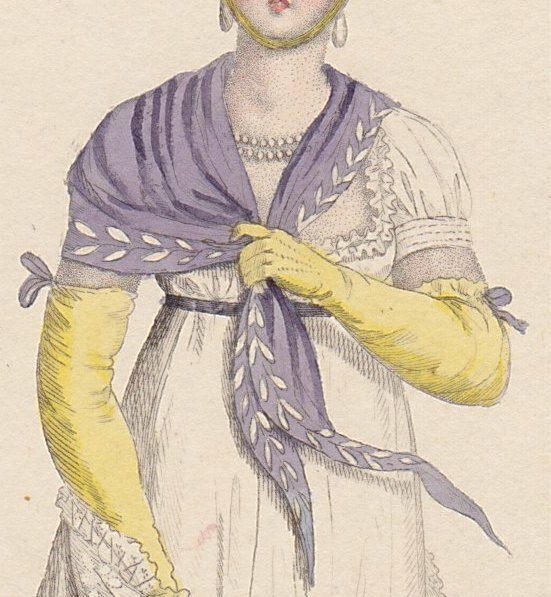 The yellow gloves with lilac ribbons holding them up are also quite jaunty. 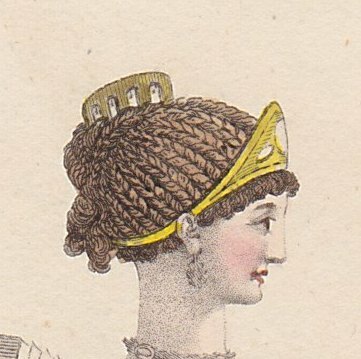 But that headdress is...um, interesting. 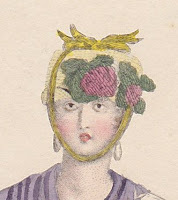 The “band of yellow sarsnet passed under the chin” makes the poor girl look like she has a toothache, don’t you think?! But toothachey or not, definitely a delight! My friends hang out in cool places. Earlier this week, I had the pleasure of staying at McMenamins Kalama Harbor Lodge courtesy of two dear ones. The four-story square structure is modeled after the Pioneer Inn on Maui, which was completed in 1901, just barely on this side of the nineteenth century. 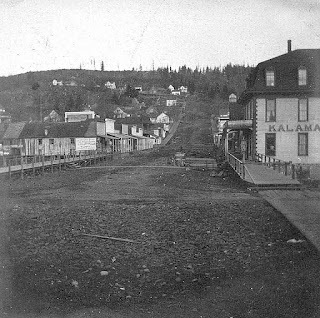 The town of Kalama itself dates from 1837, when John Kalama, a Hawaiian native, came to act as intermediary between the Cowlitz Tribe and the Hudson Bay Company. But I was shocked to learn the name of the first white settler to the area. Now, Mr. Meeker looms large in my local history, and I have blogged about him before. But I hadn’t known he stopped first in Kalama before heading north to my neck of the woods. 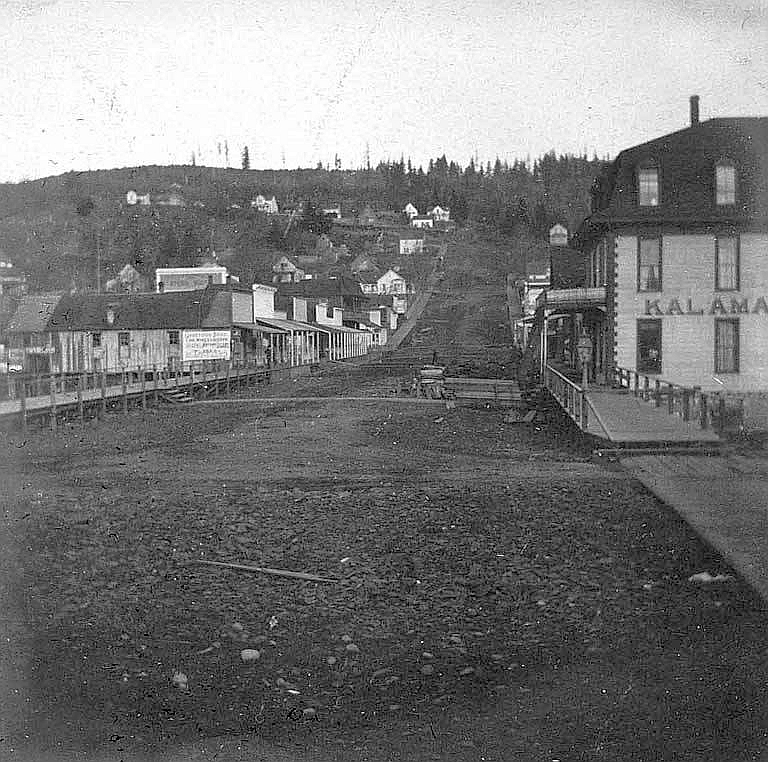 Others built Kalama into a decent-sized town, one of the largest north of Portland at that time. Today, Kalama is a cozy town hugging the Columbia River, boasting many wonderful antique stores, which we toured. I’ll share one of my finds in a future post. 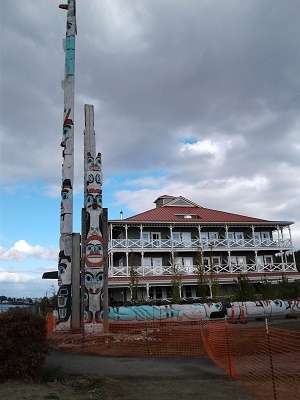 The other thing Kalama is known for are a set of four totem poles erected near the river. The largest was carved for the Seattle World’s Fair, but never quite made it out of town. It is the largest single-tree totem pole in the world at 140 feet long. Sadly, a recent assessment showed that the pole is rotting from the inside out and could have fallen in a good wind. It had been lowered onto the ground when we visited, and a group of local citizens is working to determine how it can be restored. The McMenamins group generally buys and restores historic properties, turning them into hotels and eateries. The lodge at Kalama is one of a few custom-built from the ground up. My friends and I had a blast wandering the hallways reading the various accounts of local history posted between each room. And we giggled like girls when we discovered each of the two secret rooms hidden in the hotel. If you are ever in the area, I recommend a look. A recent acquisition, however, has finally addressed that issue. 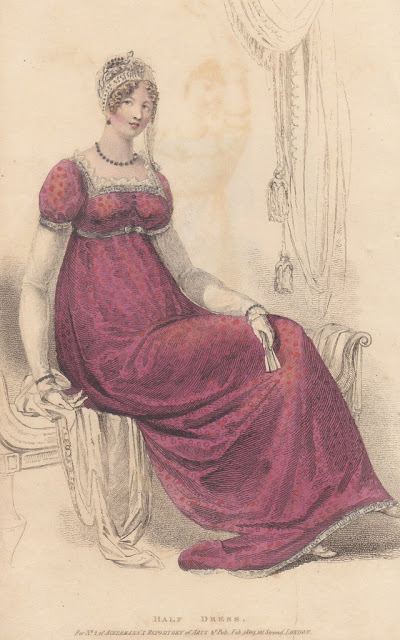 I already own and, indeed, had blogged about this plate from the February 1809 issue, depicting a buxom lady in a Half Dress (and no, that's not half a dress—"half dress" meant garb in a slighter more casual, less formal vein, perhaps for attending a smaller private party--as opposed to "full dress.") It is described as an Egyptian head-dress of silver and pearls, one point falling on the left shoulder, finished with a tassel; the hair in loose ringlets; pearl ear-rings, bracelets, and necklace; a train dress of brocaded sarsnet, trimmed with silver and vandyked; [I rather suspect this semi-colon should not be here] lace round the neck in form of a tucker, long sleeves of Mecklin or Brussels lace; white gloves and fan; shoes the same as the dress, of brocaded silk, with silver bows. 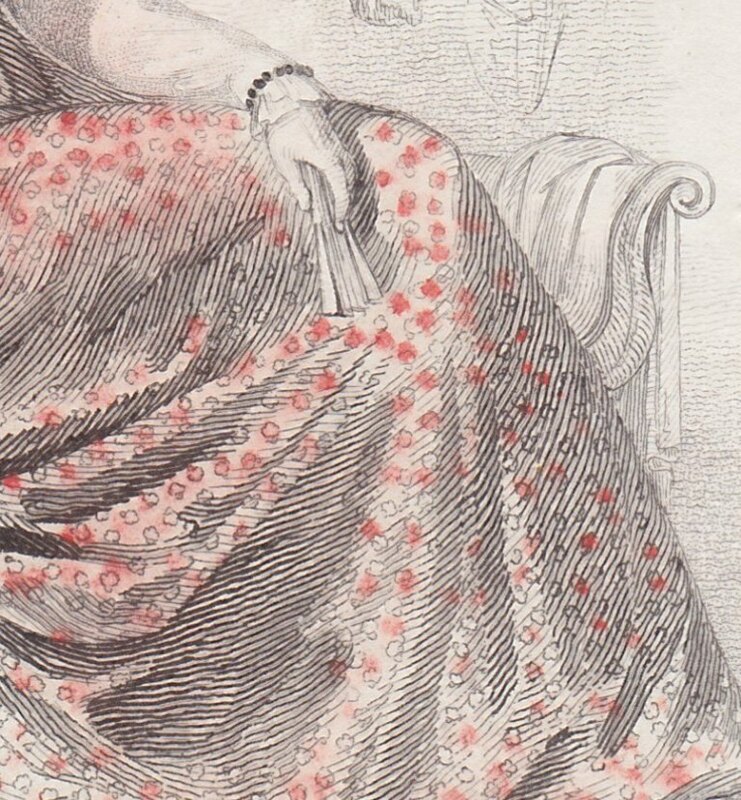 But looking at this print, it's not easy to see that the fabric is supposed to be a brocade. Which is why I was delighted recently to run across another copy of this print, which was colorized very differently as you can see at left. 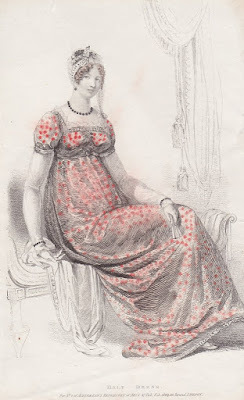 The sparing touches of red make it much easier to see that the original engraving was doing its best to depict a patterned fabric. 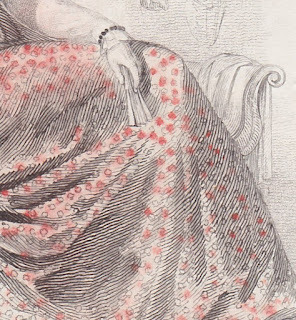 For whatever reason, as you can see in this close-up, the colorist handled adding the color to it very differently...and it's plain to see that this dress was indeed made of a patterned fabric, perhaps like some of the sarsnets we've already seen. 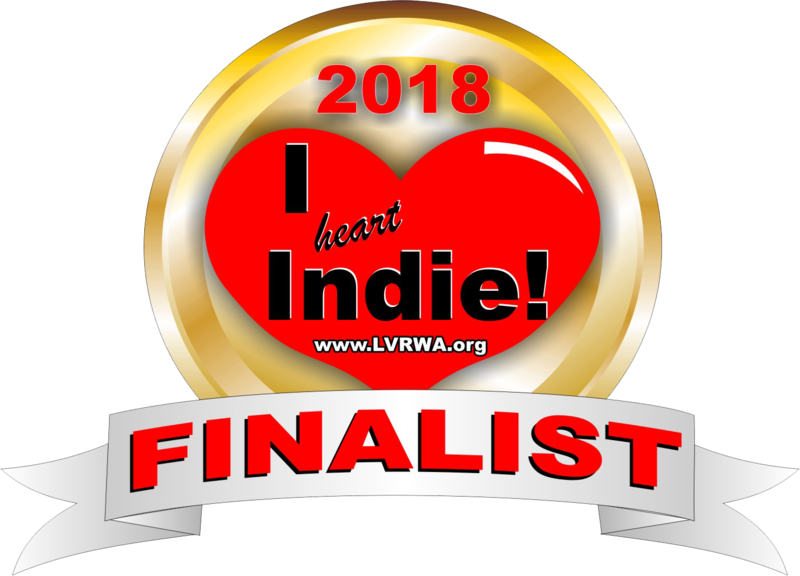 And speaking of prints...I'm very happy to report that Between Silk and Sand is a finalist in the young adult category of the I Heart Indie Contest, sponsored by the Las Vegas Romance Writers of America, which judges the cover presentation of indie and small press books. Category winners and the Best of the Best will be announced later this fall--keep your fingers crossed! *I'm sure this question has kept you all awake at night as well. Right?